Dogs dress up in the Daffy Doggie Paw-rade. Photo from Newport Daffy Days Facebook page. For the past six years, Newport has been planting daffodils like it’s going out of style in an effort to beautify the city and spread spring cheer. Once they’re in bloom, the city celebrates Newport Daffodil Days April 13–21, during a week-long festival to kick off the spring season. 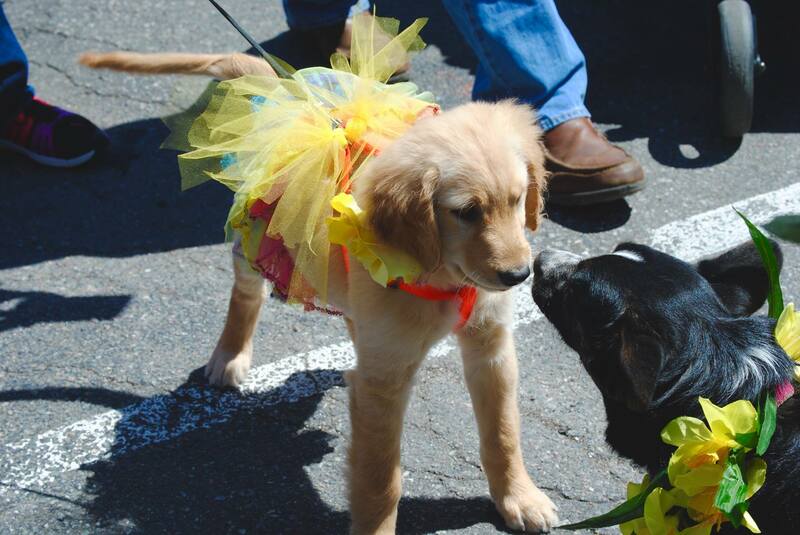 There are several events, most of them free, open to the public the week before Easter, such as this Saturday’s Daffy Doggie Paw-rade dog costume parade starting at 2 p.m. at the Black Dog on Bannister’s Wharf, and ending at 2:30 p.m. in Queen Ann Square. The dog parade is followed by an after “paw-ty” on the dog-friendly patio at Hotel Viking. The next Saturday, April 20, there will be a Driving Miss Daffodil classic car parade starting at 2 p.m. at Easton’s Beach and heading along Ocean Drive and Bellevue Avenue, and ending at the Audrain Automobile Museum, where cars will be displayed. Cars will be all decked out for the daffodil theme, and the parade will be followed by a garden party at Bellevue House. The bulbs, purchased from Holland, are planted both by volunteers and by a machine – also from Holland – that can plant up to 50,000 bulbs in half a day. The project has also worked with RIDOT to expand the planting, and with their help, has planted 80,000 flowers. The city has also donated 50,000 bulbs to Newport residents to plant in their front yards. The project is starting to expand into Middletown and Jamestown as well. “To date we’ve planted 1,904,259 daffodils,” says Hirschboeck. Check out the full schedule of events at newportdaffydays.com.